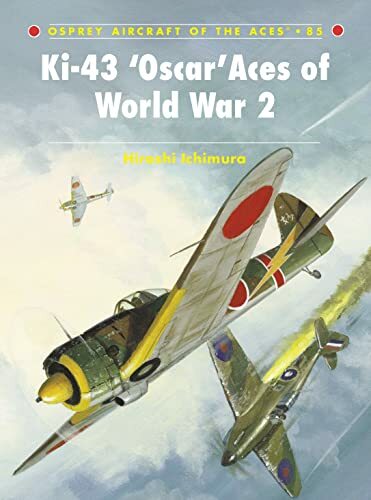 Hiroshi Ichimura has done a great service by recording the exploits of the most important Japanese army fighter of the Pacific War. The Type 1 Fighter (the Ki-43/Oscar of the book's title) was probably second in importance only to the Japanese navy's Type Zero carrier fighter, for which it was often mistaken, among Japanese warplanes in that conflict. While the navy's Zero had proved itself in combat over China in 1940 and 1941 before war exploded in the Pacific, the Type 1 Fighter was just coming into operational service when the war began. Two Hiko Sentai (Flying Regiments) were equipped with the new fighter and took part in the Malayan campaign. The story of the fighter in early operations with the 59th and 64th Flying Regiments is told in some detail. In addition to losses in combat the new fighter suffered losses caused by structural weakness of the wings and by trouble with early versions of its 12.7mm "machine cannon." Rounds from this gun sometimes exploded in the barrel or soon after leaving the barrel damaging or destroying a number of fighters (see Ki 43 Armament and About those machine guns on this website). Despite this the fighter played a critical role in operations over Malaya and the Netherlands East Indies. On Christmas Day 1941 the 64th Flying Regiment was temporarily shifted to Thailand to join in a raid on Rangoon, Burma. Here it met the Tomahawks of the American Volunteer Group or A.V.G. for the first time. The air campaign in Burma which stretched from 1941 to 1945 receives special attention in this book being covered by more than half the narrative. Additional coverage is devoted to the campaign in China. In these theaters the early combats often involved clashes between the Type 1 Fighter and P-40's of the A.V.G. or Flying Tigers. These combats are covered in some detail. Since this is an "aces" book stories of individual pilots are highlighted and insights into their personalities and activities are provided. 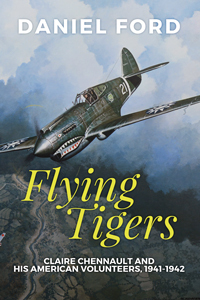 This makes the book a worthy companion to Dan Ford's Flying Tigers which illuminates the activities of American pilots in the same combats. As the Burma war continued the Type 1 Fighter continued to bear the brunt of growing Allied air power. At first opposed by Curtiss Mohawks and Hawker Hurricanes the Type 1 Fighter later had to compete against Spitfires, Mustangs, and P-38 Lightnings as well as late model P-40s. In many cases the text provides details of actual losses suffered on each side rather than claims of losses inflicted. These details show that the Type 1 Fighter pilots did surprisingly well against faster more powerful Allied fighters. In Burma and in China the highly maneuverable, lightly armed fighter was also able to score successes against formidable Allied heavy bombers such as the Consolidated B-24. The book's coverage of combat operations in New Guinea and later in the Philippines is much less extensive than the attention paid to Burma. Nonetheless it is highly informative. Details of the early operations of the 1st and 11th Flying Regiments are well covered. Mention is made that units equipped with other types of fighters (13th and 68th Flying Regiments) flew Type 1 Fighters as a stopgap when replacements for their Type 2 two-seat fighters or Type 3 fighters were unavailable. Unfortunately coverage of the operations of these and some other units is scanty. Additional details on Ki-43 operations in New Guinea in 1944 can be found in "Lucky Sevens" on this website. Despite its many virtues this book contains a few flaws. The source of the fighter's name, Hayabusa or Peregrine Falcon, is ascribed--no doubt correctly--to a public relations officer in Tokyo in March 1942. However, the Allied codename "Oscar" is said to date from the same period. In fact the Allied codename system was not initially promulgated until the autumn of 1942 and "Oscar" did not come into common usage until the end of 1942. Hiroshi Ichimura seems reticent to debunk certain Japanese claims such as the claim of Sgt. Maj. Naoji Menya of the 24th Flying Regiment to have shot down four B-24s in a single mission in May 1943. In the case of Sgt. Satoshi Anabuki, considerable space is devoted to the October 1943 mission in which he claimed three B-24s and two P-38's destroyed. The author comments that he has not been able to verify the Allied losses and a pilot from another Japanese fighter unit was skeptical of the claim. In fact the claims were a complete hoax as no Allied raid even occurred at the time and place of the alleged events. The book is well illustrated with black and white photographs. There are thirty-two color profiles. Each profile is keyed to a detailed written description giving the pilot and context of time and place where the aircraft operated in the colors and markings shown. In addition 1/48th scale drawings of the different versions of the Type 1 Fighter are included. Hiroshi Ichimura is to be congratulated on an excellent effort. This book covers a gap in available literature on the Pacific air war. The book provides insights into a notable fighter, its units, pilots and the campaigns where it operated. This book is a keeper; recommended both for the libraries of Pacific war neophytes and aficionados. The Only War We've Got: A reporter's journal: the Vietnam War before it all went sour.